2016 has been a rather tragic year, as far as celebrity deaths go. While a lot of people I know would dismiss them, or make harsh comments, or suggest that we shouldn’t be affected by the death of celebrities, considering we don’t truly know them, I always feel, in some way, affected by their deaths. I don’t always make comments, or blogs, or posts, but given what has happened in just a few short days, I am compelled to write. Of course, there have been a few deaths this year that have affected me. David Bowie, naturally, and I shed a few tears when I discovered that Alan Rickman had passed; immediately thinking of my sister, and the times we spent watching Harry Potter growing up. But, the deaths of Carrie Fisher and Debbie Reynolds have affected me more than most deaths this year. Given the overall geeky tone of my blog, it should come as no surprise that Carrie Fisher holds a special place in my heart. She was, of course, the inimitable Princess Leia; an inspiration and role model to so many women, young and old alike. 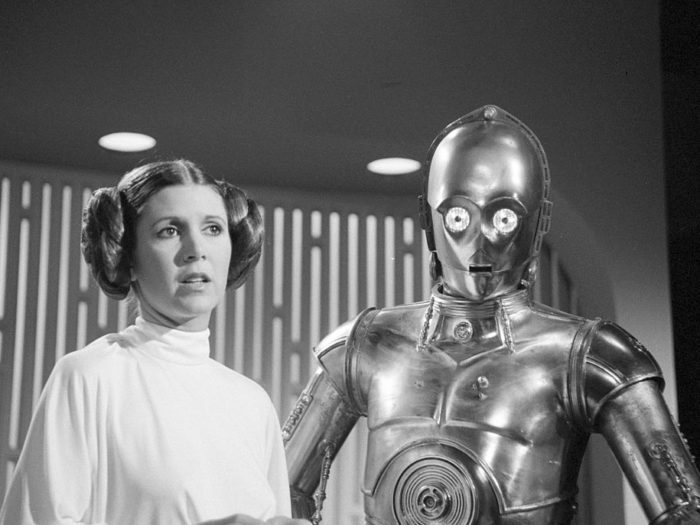 Princess Leia, while certainly embodying the physical traits of a princess, was so far removed from the archetype given to traditional princesses. Leia was a leader, and put herself in harm’s way to do her part for the rebellion; enduring imprisonment and torture, while watching the people she cared about defeated in suffering. Yet, Leia remained strong. However, as General Organa, she’s even more brilliant than she was as Princess Leia. If you think about it, Leia’s suffering didn’t stop; her brother disappeared, she lost her son to the dark side, and her relationship with Han Solo ended in turmoil, before ending indefinitely at the hands of her own son. While Han and Luke left the fight much earlier, she stayed on the frontline, doing her part for the rebellion, knowing that rebellion success would mean losing her son forever – yet, she endured. In essence, Carrie Fisher embodied so many characteristics of her Star Wars character. Battling her mental health demons for so many years and still remaining vivacious, hilarious and strong had to be no mean feat, yet Carrie Fisher did it. I suffer from anxiety and depression a lot more than I ever let on, and more often than not, it consumes me to the point that I feel powerless and unable to do anything other than sleep it off, yet Carrie Fisher endured, and remained victorious against her demons. She was a true hero, both in film and in life – and she will remain so in death. When I read that she had taken ill, I felt sadness. But, a part of me felt that she would endure as Carrie Fisher has always endured; I felt she would be well and joking about it in her next Tweet or novel. Yet, for the first time, Carrie Fisher was unable to fight her way out of a difficult situation, and admittedly, I felt both shock and sadness at that. But, I do feel that her death has served as yet another reminder to so many women that we don’t need to be held back by our demons, or our gender; we can do whatever it is we need to do in order to be happy or to succeed. Carrie Fisher will never be forgotten, and the force she carried within her will continue to shine, in whatever far, far away galaxy she finds herself in now. When Carrie first fell ill, my thoughts immediately went to her mother – another hero of mine, and I hoped that Carrie would pull through for her mother, more than anything. This morning, i woke up with an intense sense of anxiety; I didn’t feel up to leaving my bed, and the idea of going out and seeing friends later on tonight, inspired me with feelings of dread. I knew today was going to be a difficult day for me, so I showered and went back to bed, in attempt to sleep off the anxiety weighing on my mind. Not too long after I dropped off, my boyfriend came to wake me and told me that Debbie Reynolds had passed away. Ironically, I always have Debbie Reynolds on my mind at this time of year. My birthday is Christmas Eve and one of my traditions is to watch very old movies. Singing’ in the Rain is a steadfast tradition, even if the other movies vary somewhat. It’s a movie that fills me with warmth and acts like a comfort blanket, in the sense that I feel nothing could truly go wrong, as long as you’re watching Gene Kelly and Debbie Reynolds effortlessly dance and sing their way through a beautifully classic musical. The smile on my face, as soon as the movie begins, up until it ends could be seen from space; the music, the acting, the comedy and romance – the dastardly, yet comedic villain and the feeling of genuine happiness throughout is such a warming feeling; a feeling that not very many other movies can even begin to emulate. So, for many reasons, Debbie Reynolds has been on my mind, and since hearing the news, I’ve found it difficult not to cry at the cruelty of death, or the sadness of losing life’s truly genuine people. 84 might be old to some, but in a few short days time my own granddad will be 87, and to me, that’s still not an age where I think ‘yep, this is an appropriate time to die’. Death is vicious and unforgiving, and losing both Carrie Fisher and Debbie Reynolds in such a short space of time is genuinely tragic, regardless of your feelings on celebrity deaths. Furthermore, to lose two brilliant women from the same family, in such a close proximity, is even more painful; it’s heartbreaking. On my birthday, I bought a retro movie print; a Singin’ in the Rain movie poster. Today, I received a partial refund, with a note that said the seller wouldn’t feel comfortable profiting from the death of Debbie Reynolds, and charged me for the shipping from LA to England alone. My heart felt so full at this act of kindness, that I picked up my laptop to write. Celebrity deaths certainly mean something, particularly when those who have died have such a profound and lasting effect on who we are as adults. Both Carrie Fisher and Debbie Reynolds have instilled morals and helped shape my character as a strong, independent woman who is unashamed about the demons she’s forced to carry. Rest in peace, ladies, may the force always be with you both. This is such an amazing and fitting tribute to such great women. Admittedly, I teared up reading it and overcome by how much their fierce spirits and talent inspired so many of us. The post title is absolutely beautiful too. Thank you for sharing! La La Land: the start of something wonderful and new? - The Geek, Simple.